Our ground sausage is seasoned just right for any dish. You will be amazed at the flavor and lean fat content in this sausage. Delicious, freshly ground pork in 1 lb. packages. This sausage has just the right kick for your dish. I'm not a crazy HOT fan, but Paul and I both like the kick in this sausage. 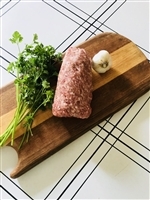 You will love our ground sausage: fresh and not dripping with fat.